TheLotter is the best place to play the lottery online. And there are $90 million reasons why! TheLotter stands far ahead of the competition in terms of game variety, player support, and overall ease of use. This website acts as a ticket agent, buying official lottery tickets on your behalf. Through theLotter’s convenient system, you can enter any of 52 lotteries from all over the world --- including huge games like the US Powerball and Mega Millions. We highly recommend you check out TheLotter's discounts and limited time offers! You can choose to play solo, as part of a syndicate, or both. TheLotter supports multiple languages and currencies, as well as 20+ banking methods. If you’re always on the go, you can even keep up with your games through theLotter’s iOS and Android apps. So should you give theLotter a shot? Learn more in our detailed review. TheLotter started in 2002, and it buys tickets on players’ behalf for 52 different lottery games, including the US Powerball, MegaMillions, and EuroMillions. To date, theLotter has had over 4 million winners, paying out over $90m in prizes. TheLotter is one of online lottery’s pioneers, and it remains one of the biggest online lottery websites. It’s owned and operated by Lotto Direct Limited, a duly licensed company with headquarters in Malta. TheLotter also has local offices in over 20 different areas, ensuring speedy ticket purchases for a wide variety of international lotteries. TheLotter is an online lottery agent. It buys tickets to official lottery games on users’ behalf. There are 52 lotteries available, and you can buy as many tickets as you want. Single Play: Buy at least 3 and up to 25 tickets in one go. Pick your own numbers or use Quick Pick. 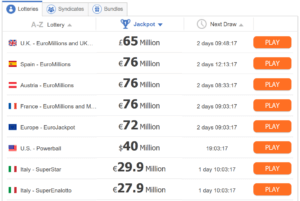 Syndicates (Group Play): Buy shares in a large set of tickets. Split costs and winnings with other players. 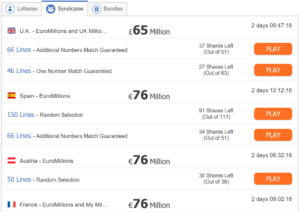 Bundles: Get the best of both worlds by combining syndicate shares and personal tickets. Multi-draw purchases: You can “buy ahead” for as many as 52 draws. This makes sure you don’t miss any future draws. Subscriptions: Similar to multi-draw purchases, a subscription automatically buys you tickets for upcoming draws. TheLotter even runs a free ticket promo for subscribers. Systematic forms: Get tickets that automatically cover every possible combination of your chosen numbers. More expensive, but it can boost your chances. The best thing about playing at theLotter is that you’re an official participant in any lottery games you choose to play. Whether you buy personal entries or join a syndicate (or both! ), you’ll always have an actual entry. Plus, any winnings will come directly from the lottery operator — not theLotter. Unlike many lotto betting sites, theLotter doesn’t depend on its own revenues or insurance coverage for prize payouts. You’re far more likely to receive your winnings. Limited Time Deals On TheLotter! TheLotter’s login and registration are a breeze. You can even sign up with your Facebook account. Signing up for theLotter takes less than a minute. You don’t need much when you create an account: just your email address, preferred password, and country. For even faster registration, you can sign in using your Facebook account. Easy peasy, right? Players from all over the world can register. The registration form doesn’t exclude countries where online lottery is illegal, either. Of course, if it’s against your local laws, you sign up at your own risk. Already have an account? TheLotter login is here. You can get tons of limited time deals on theLotter. For example, players who buy at least 4 shares to Spain’s Loteria de Navidad (Christmas Raffle) right now will get a 10% discount! For more consistent discounts, there’s theLotter VIP Club. You don’t need anything special to join — just keep playing through theLotter. Every $1 you spend is worth 1 VIP point. The more VIP points you have, the higher your level — and the bigger your discount. VIP Club members also get access to exclusive deals and promotions. Plus, they get priority assistance from theLotter’s customer support team. TheLotter gives you 25 VIP Points when you sign up for a subscription. Subscribers also get every 10th ticket free. No other website can compete with theLotter’s list of lottery games. An account at theLotter lets you play any of 52 lotteries from all over the world. That’s more than double what you’ll get at competing lottery sites. TheLotter also carries syndicates, but it doesn’t offer scratch cards. Of course, with 50+ games, theLotter has more than enough variety, even without scratch cards. You’ll find blockbuster games like the US Powerball and Mega Millions here, of course. But there are also excellent (though less popular) alternatives like the French Loto, Australia’s Oz Lotto, and more. TheLotter carries several Powerball games from different countries. There’s the ever-popular US Powerball, of course, but you’ll also find Powerball games from Australia, New Zealand, and South Africa. All of these Powerball games are available for solo play. If you want to boost your chances, theLotter also offers syndicates and bundles — some using pre-selected random numbers, others using theLotter’s systematic forms. If you’re new to lotteries, theLotter also provides a comprehensive overview of all the games on its roster, including the various Powerball lotteries from the US, Australia, and more. You can see important details like draw schedules, the range of numbers in play, and even your odds of winning each Powerball prize. As with all of theLotter’s games, you can view Powerball results straight from theLotter’s website. You can play the US Mega Millions through theLotter, too. Like the Powerball, theLotter offers entries in the form of solo tickets, syndicates, and bundles (a combination of both). TheLotter also carries a page dedicated to giving you more information about the Mega Millions lottery. You’ll find draw schedules, your odds of winning, and even guidelines for taxes on winnings. 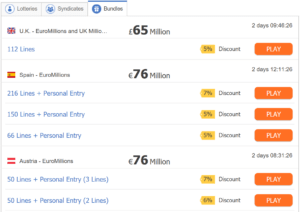 TheLotter lets you buy tickets for EuroMillions from Spain, Austria, or France. It’s up to you to decide which one to enter. The main difference? For Spain and France, a ticket also counts as automatic entry to the corresponding country’s millionaire raffle: El Millón (Spain) and My Million Raffle (France). You can buy standard solo tickets, participate in syndicates, or try both through theLotter’s convenient bundles. If you want to learn more about the EuroMillions lottery, theLotter also has informative pages for all three variants on its site. You can track 90+ lottery game results on TheLotter’s website. TheLotter reports results for the 52 lottery games it carries, and then some. There’s a dedicated page where you can view results for 97 lotteries in all. You’ll find the usual big jackpots (like the US Powerball or Australia’s Oz Lotto), as well as less popular lotteries like the Irish Lotto, Ukraine’s MegaLot, and more. TheLotter even includes draw schedules so you know which lotteries will have results soon. You can also activate notifications to get alerts for your favorite lotteries’ results. TheLotter doesn’t offer any scratch cards. TheLotter gives you 30 syndicates to choose from. These cover popular games like the Powerball, Mega Millions, and EuroMillions, but you’ll also see support for smaller games like the Vikinglotto or the Australia Powerball. Bundles are great if you want the best of both worlds. If you want to try your luck with both group and solo play, theLotter has you covered. Their bundles combine syndicate shares and personal tickets in one package. You’ll have over 60 bundles to choose from, covering everything from the US Powerball and Mega Millions to Australia’s Oz Lotto, Saturday Lotto, Wednesday Lotto, and Monday Lotto. Not at all! With almost 2 decades in the business and over 4 million winners on record, theLotter is the prime example of a reliable online lottery website. Thanks to its lottery agent business model, any ticket you buy is an official entry to your chosen lottery game. Any winnings come directly from the lottery operator. All the available lotteries are legitimate games, too, from the US Powerball to Australia’s Oz Lotto. As proof of ownership, you get scanned copies of your purchased tickets. Once scanned, the physical tickets are stored in a secure safe until you need them. What’s stopping theLotter from taking your prizes for themselves? Well, they’re licensed under the Malta Gaming Authority. That means all of theLotter’s operations are monitored and regulated by Malta’s government. Yes! TheLotter is operated by Lotto Direct Limited, a company that’s registered and based in Malta. Absolutely. Every action you make on theLotter’s website passes through 128-bit GeoTrust SSL encryption. You can easily get details about how theLotter handles your tickets and transactions, so they get plus points for transparency, too. TheLotter is also PCI compliant, meaning all financial transactions and payment credentials are airtight and adhere to stringent banking regulations. Is theLotter a real or fake company? TheLotter is a real company, and it’s been in business since 2002. The website is run by Lotto Direct Limited, which is based in Malta and also operates out of 20+ local offices all over the world. Lotto Direct Limited owns and runs theLotter. The company is duly registered in Malta, where it has its headquarters. Every ticket purchase on theLotter includes a handling fee. This is how theLotter fuels its operations. Yes! All of theLotter’s operations run under a license from the Malta Gaming Authority. Depending on your country’s laws, though, using theLotter’s services might not be allowed. It’s best to check if your country has laws against playing lottery online. Does Lottery Critic Trust TheLotter? Definitely. TheLotter was one of the first online lottery services around, and their longevity says a lot about how reliable they are. From SSL encryptions to legitimate government licensing, theLotter also has solid measures in place to protect players. Finally, they’ve got a good track record of winners and payouts, so you’re sure to get your winnings. TheLotter makes it as easy as possible to claim your prizes. TheLotter doesn’t charge commissions on your winnings. However, it does deduct any local taxes that might be required by the law in the country where a lottery is based. Secondary winnings are collected and deposited directly in your TheLotter account. For big or locally taxed prizes, you’ll typically have to claim these yourself. This is especially true for jackpots, which lottery operators often require winners to claim in person. For non-jackpot prizes that are above $2,500 or taxable, if the local law permits it, TheLotter tries to collect these on your behalf and credit the amount to your account. You get 7 options for withdrawing your winnings from your TheLotter account. Most of these are through bank transfer or trusted banking networks like VISA and MasterCard. The Lotter gets two thumbs up 👍👍 for accepting a wide array of payment methods. You have 25 deposit methods and 7 withdrawal methods available. That’s more than you get from many other lottery websites. Better still, theLotter’s banking methods work with a wide range of currencies, too. Has anyone won on theLotter? Absolutely! Over 4 million people have won prizes through theLotter since the website started in 2002. There’s even a (long) list of winners on theLotter’s website! Here are some of theLotter’s most recent and notable wins. There are currently 5 winners of $1M prizes each. Four of them hit the US Powerball’s second prize by matching 5 of the winning numbers. Another hit the $1M US Mega Millions prize in 2017. In 2016, another player won much more than $1M. A lucky player from Iraq bet on the Oregon Megabucks lottery through theLotter and won the $6.8 million jackpot! G. won $1 million by hitting the second prize for the US Powerball’s draw in October 2016. He had been playing through theLotter since 2003. G. racked up over 452 wins of minor prizes from various lotteries before hitting the million-dollar Powerball prize. 8 lucky Aussies struck gold with $106,300 in prizes after joining theLotter’s Powerball syndicate. Every line in their syndicate’s set won a prize, and the total was split among the 55 players who bought shares. L.M. won €25,000 from La Primitiva in 2015 by purchasing tickets at theLotter. Howard L. won 885,377 rubles in the Russian Gosloto 6/45 lottery after just 6 months of playing through theLotter. B.U. won $1 million after hitting the US Powerball’s second prize in April 2012. The major win came just five tickets after B.U. first started playing at theLotter. In another stroke of luck, B.U. won shortly after the US Powerball’s new prize rules bumped up the second prize from $200K to a cool $1M. F.M. won €47,748 in Italy’s SuperStar draw after matching 5 of the winning numbers. Aura D., a player from Panama, holds the record for theLotter’s biggest win so far. Aura got $30M as the sole winner of the Florida Lotto on July 19, 2017. She flew in on theLotter’s dime to claim her prize and has been living out a happy retirement since then. Aura’s quiet post-win life is pretty typical for lottery jackpot winners. Check out our article on lottery’s big winners to learn how other lucky players chose to spend their millions. 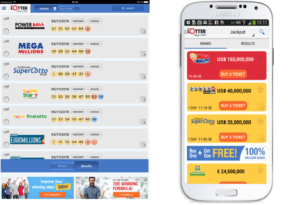 TheLotter lets you play lottery games — anytime, anywhere, on both iOS and Android. TheLotter can keep up with even the busiest lifestyles, thanks to excellent mobile apps for iPhone, iPad, or Android devices. TheLotter’s app boasts a sleek interface and works without a hitch. If you’re always on the go, it’s a fantastic mobile lottery companion. TheLotter gives you 24/7 support and tons of lottery resources. TheLotter clearly makes it a mission to help you succeed. If you ever need help, you can reach their support team via a ton of channels. TheLotter’s customer support services are all available 24/7 and take inquiries in 14 different languages. Email: We sent test inquiries and got a response within 2 hours! Aside from these support channels, you can also check out theLotter’s comprehensive FAQ and lottery game guides. TheLotter sets a high bar for online lottery services. We know the ease of buying tickets and getting support from theLotter firsthand. Long story short: we’re all praises for this lottery agent. Sure, those of us who love scratch cards are a bit disappointed, but that’s a minor quibble. As a lottery agent, TheLotter hits all the right notes. TheLotter boasts a simple, easy-to-use website. Design is one of the most basic things about a lottery website. After all, you’re spending a lot of time there, right? Luckily, theLotter has a well-designed website that’s easy to navigate, even if this is your first time trying online lotteries. It’s refreshing to see a lottery website that isn’t saddled by poor or outdated website design; even more so when it isn’t littered with distracting and annoying ads. Though theLotter isn’t unique in this regard, it is one of the better sites that puts a premium on user experience. Navigation is a breeze. All the information (and there’s a lot!) is well-organized, so you’re never overwhelmed. You can jump quickly from lottery results to jackpot updates, game news, and more. TheLotter offers new players a full refund on their first purchase if they’re not happy with theLotter’s services. All it takes is a quick message to their support team, and you’ll get your money back. You get six months from the time of purchase to claim your refund. Note that this only applies to your first ticket. It’s a great safety net if you’re just trying out theLotter — you can check out their services without risking your money. While theLotter isn’t an official partner of Australia’s lottery operators, it’s perfectly legal to join in Australia. In fact, there are a fair number of Aussies who have won prizes from lotteries around the world via theLotter. 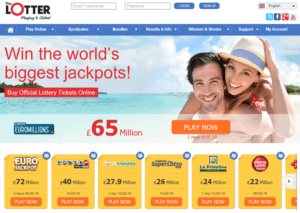 TheLotter doesn’t carry the UK National Lottery, but you can still join major European lotteries like the EuroJackpot and EuroMillions. You can even venture outside of the continent and try your hand at popular games like the US Powerball, Mega Millions, or various lotteries from Brazil, Australia, and more. Thanks to the US’ laws about online lottery, you’re unlikely to hear of US-based winners at theLotter. Federal laws still forbid participation in online lotteries, and there aren’t a lot of states where you get enough of a legal grey area to participate. That said, theLotter has robust support for players who want to join the US Powerball and Mega Millions lotteries from other countries. Should you try theLotter? Absolutely. You get tons of lottery games to choose from and a fantastic playing experience. Sure, theLotter charges slightly more than their competitors. But for those fees, you get 52 games, group play options, a good VIP discount system, rock-solid security, and a robust payout record. And that’s not even all of theLotter’s good points. There’s a reason theLotter has stayed on top of the online lottery game for more than a decade now. Whether you’re a newbie or a seasoned player looking for a change of scenery, there’s no better place to play than theLotter. Let’s say we win the grand or secondary prize which requires personal travel, will the Lotter accept our request to immediately write a name as shown on the Lotter Account on the back of the ticket and send a video and photocopy of the front and the back of the ticket as a proof to show the ticket has been registered under our name? TheLotter only states that it will preserve the ticket in a safe but no where in the website you mention how a winning ticket name holderwill be gurenteed so we can be assured the ticket is safe till the visa and travel arrangements are completed? This copy can also be used as a proof to lawyer till we can claim the original from the Lotter. Otherisw, nothing is stopping any other person or employee from claiming the bigger prized tickets 50m+ and writing their own name before the winnercould arrive. Good and detailed information for the Lotter. Let me know if it accept the Indian currency : I am from India. I’m interested to know in details its AFFILIATION programme, plz provide the same here in your site. Hi, thanks for your kind words! Here’s a link to TheLotter’s Affiliate Program. Also, here’s a link to the comparison of the best lottery affiliate programs. I have an account with thelotter, I’m in Spain but recently the website won’t allow me access anymore. It just says that it’s not safe and there is an error. I think I have a couple of euros still in my account but I’m not able to access it. Hi, Natasha. Have you tried clearing your browser cache and trying the website again? We’ve checked and the website is loading fine. If the problem persists, and you’re still having trouble reaching the site, consider contacting theLotter’s support team through WhatsApp, Viber, Facebook Messenger, or Telegram. Hope that helps! That means they just missed the cutoff for the week. The good news is that our giveaway is a weekly thing, so they can try to re-enter again once the new giveaway starts (which is right now, actually!). I’m super excited to play with theLotter credits I won from Lottery Critic’s giveaway! And hope my good luck continues when I play the lottery! Thank you again LOTTERY CRITIC! Creating an account at theLotter is completely free. You don’t have to pay for anything other than the tickets your purchase. They don’t take commissions either. Take note that taxes may be deducted from your winnings, but this depends on the game and where you live (and is out of theLotter’s hands). Yes. I can attest to the awesome services and games provided by Lotter. I have been having games with them for months now, and my winnings have been amazing. their easy-to-use app and easy withdrawal rock my mind always. Only Lotter and Lottery master, which is another great lottery site has these kinds of features and I must say the two sites deserve more than 5-stars anywhere and anytime.